Do you have a budding domestic Goddess or God in your household? 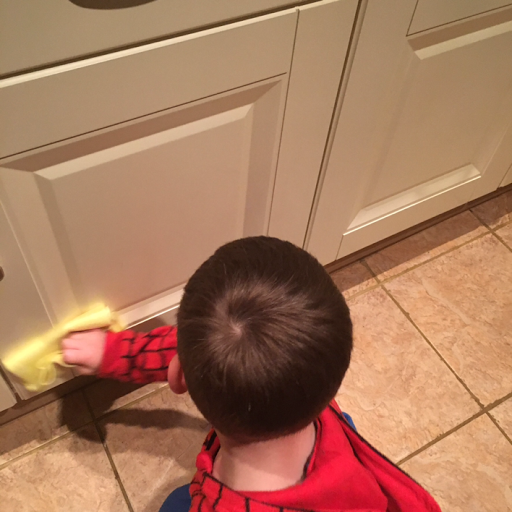 What is it about kids that they absolutely love to clean! Give T a cloth and sprayer full of water and he's happy as Larry! And I often saw the children at nursery in the role play kitchen doing their chores. I've seen a lot of social media posts recently about chores for small children and I'm not quite sure where I fit with them. Some I've seen are complely crazy, like asking a 5 year old to clean a toilet or getting an 8 year old to do the washing!! Whilst I'm all for kids being given responsibilities I think there are some things that children just shouldn't be expected to do. I also struggle with the concept of being rewarded for doing chores. 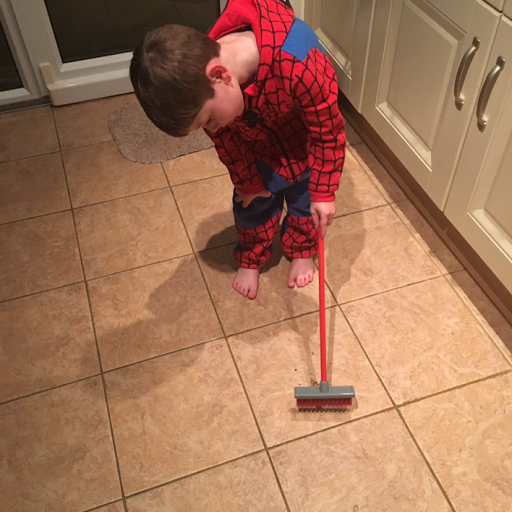 T isn't really given rewards for the chores that he's done, it's kind of expected of him, so we haven't really had the need to use rewards to get him to get the work done. Ever since he was small, he's wanted to clean. At home. At nursery, heck, I'm sure he's probably asked at school by now! If he's not cleaning the sofa with baby wipes he can often be found with his sprayer and a cloth, cleaning something. Or even when we are out, he'll get out the baby wipes and clean the table after he's used it!! 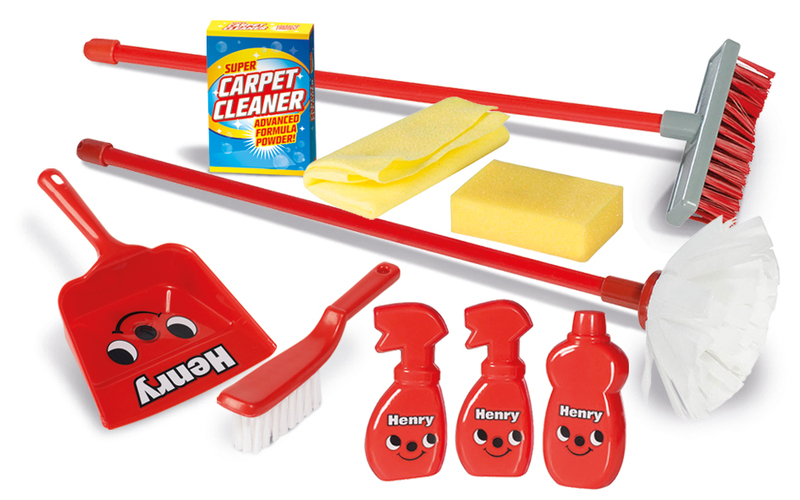 So when I was asked if I'd like to review a Henry Hoover cleaning set from Casdon of course, we were very happy to. The set is of high quality and contains some really great components, including a dustpan and brush, broom, mop, sponge and role play cleansing products. 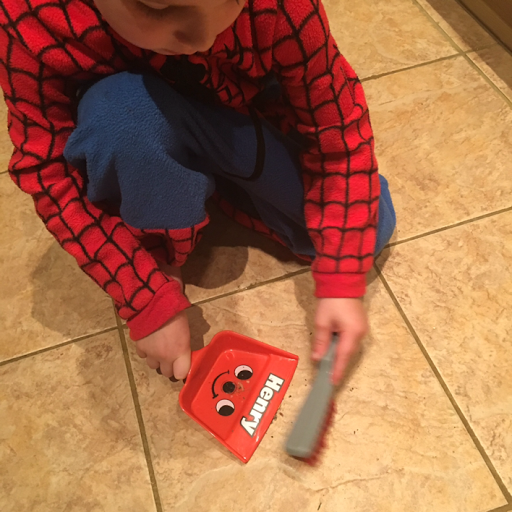 Whilst most of the products actually work, they are perfect for role play too, copying mummy - or daddy(!) whilst cleaning or just enhancing their every day play. 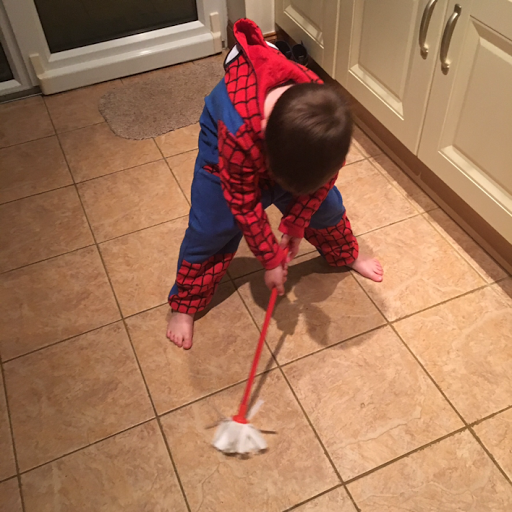 The set is aimed at children 3-6, and although T loved it, in my opinion, the mop and broom, were way too small to be practical, T is your average sized 4 year old and has to really bend over to use them, there's no way he would use something of this size in 2 years time. T was thrilled to get his own sponge and cloth and has used them lots of times to pretend to clean, mostly his bike and scooter! Again, personal opinion, but I do think that the makers missed a trick in making the spray bottle only a 'play' toy, I think a real working water spray would have really improved this product and transitioned it more from a role play toy into a more useful set. Priced at £10.00. I think this kits is reasonable value for money, I think you are paying for the name over the actual product, but it got huge thumbs up from T. I love how there are 2 versions and that the makers haven't been sexist in just producing the Hetty, pink version. You can find out more about Casdon on their Facebook and Twitter accounts. 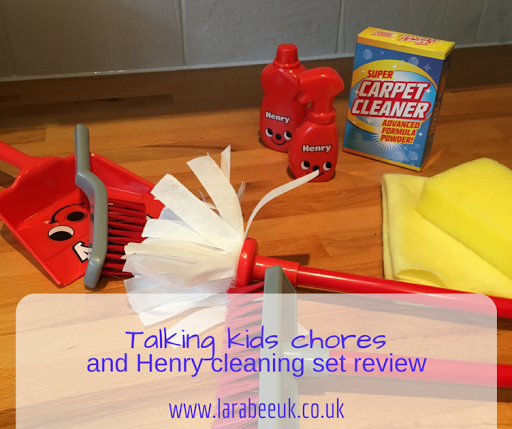 How do you feel about kids chores? What chore do your children like doing the most? *Disclaimer, we were sent this toy in exchange for our honest review.